I remember the day my future husband and I decided to get a dog. Sitting outside at one of our local brunch spots, we seemed to be the only couple without a pup. Casually mentioning that I wanted to get a dog one day, he suggested that we get one together. It didn’t take long for me to tell him about my dream dog, the French Bulldog. At the time, hardly anyone had a French Bulldog, not even in Manhattan. Gasp. Nor did people even know what one looked like. I first learned of the Frenchie years before, when flipping through a magazine, I found a photo of a celebrity and his pet French Bulldog. It was love at first sight for me. And, so soon after, we got this guy: Baxter, the coolest looking dog who ever lived. People stopped us on the street daily. Passersby called out his name, without knowing mine. He was a celebrity magnet and a celebrity in his own right. Flash forward to more than a decade later and the French Bulldog is everywhere: on clothes, bags, movies. This year, the French Bulldog is expected to take the top spot as Britain’s most popular breed, with a staggering 3,104 percent increase since 2007 (one year after we got Baxter) and continues to be the most popular breed in New York, where I live. When our poor dog passed away this year, we knew it was only a matter of time before we got another French Bulldog. If only, it were as easy as that. I’ll admit it, we got Baxter from pretty shady circumstances, although we didn’t know it at the time. What we learned during a Google search years later, shocked us: Our breeder wasn’t a breeder at all, but a broker. She got her puppies from puppy mills in Russia. The puppies, taken too early from their mothers, were shipped on a plane to the Poconos, Pennsylvania, where our breeder passed them off as her own. We were lucky. Our dog was healthy but many of the puppies she brokered died en route or soon after, while others suffered from various diseases. The government eventually caught up with her, fining her and ultimately, putting her out of (her lucrative) business. If you know me from my blog, I research everything. So how did this happen? I came armed with a list of questions for the breeder. And she lied about every single answer. French Bulldogs are an interesting breed. With their larger than necessary heads, most breeders deliver their puppies via C-section. Further, due to the dog’s squatty build, most conceive by artificial insemination. Besides the added care needed to deliver a healthy puppy, there’s also the added expense. The basic laws of economics come into play here. When you combine a huge demand with a limited supply (and the above-mentioned expenses), you’ll find high prices and/or shortcuts. These shortcuts include puppy brokers, mills, and backyard breeders. The prices of Frenchie puppies have skyrocketed. Expect to pay several thousand dollars for a purebred Frenchie. Frenchies innately have serious medical problems. With their pushed in faces, they can suffer from respiratory issues. Their stout bodies and bowed out legs can lead to joint and knee pain, spine deformations, and IVDD (what Baxter had at the end of his life). Not to mention, many Frenchies have dietary and skin allergies. Now add in a puppy mill dog, with heightened hereditary conditions, and it’s no wonder that Frenchies are not the healthiest breed. The imported Frenchies, the East European French Bulldog (Baxter) look different from your typical Frenchie They have a longer, more muscular body, with a more prominent snout. 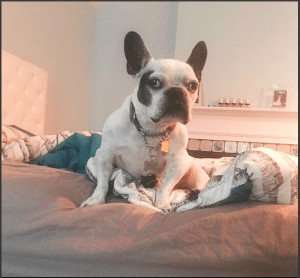 They tend to be more aggressive, which we did not find with Baxter, but he did bark excessively (not a trait of the American French Bulldog). First and foremost, do your research! Reach out to anyone you know with a French Bulldog and ask if they would recommend their breeder. Sadly, I did not get a stellar review from anyone. Join Facebook groups (I’m even a member of one called “How to Recognize a Bad Breeder). Ask members about their dogs and breeders. Once you identify a potential breeder, ask for references. About 2/3 of the people I reached out to through text or Facebook Messenger failed to respond. Those that did, gave me invaluable information. Google the breeders. I eliminated some based on their web pages and information found online. Ask the breeder questions, especially about the parents of the puppy (temperament, health, and if possible, if you could meet the mother. At the very least, request photos and videos of mother and pups). Go with your gut! After all of the above, my breeder just felt right. She was forthcoming, honest, and communicative. I initially tried the rescue dog route and I encourage you to do the same. Unfortunately, none of the available dogs fit my lifestyle, either having expensive medical issues or not recommended with young children. Also, after watching my children grieve the loss of their pet, I wanted only a young dog. This post is not intended to diminish the hard work and devotion of dedicated breeders. They are out there. The kicker is that in the end, I didn’t get a French Bulldog. Well, that’s not entirely true. You’ll have to wait for my next post to meet her. Go to http://www.thewrongpuppy.org for information about the importation of French Bulldogs into the USA. Also https://frenchbulldogclub.org for more information about French Bulldogs. I’m still grieving over the loss of mine 2 years ago. One thing that did help was getting a puppy, but only when the time was right. I’m sorry for your loss. I’ll definitely check it out! Pet insurance wasn’t an option then either as they didn’t cover any congenital diseases or anything prone to the breed (hips, nasal, eyes, etc). I’m on a lot of Frenchie FB pages and the stories are heartbreaking. My breeder was truly criminal. Shared your story on Twitter. Following your blog now too ???? Very honest blog! Good info!